From Bunnie: chumby hacker boards (now available in beta) « Adafruit Industries – Makers, hackers, artists, designers and engineers! The board is priced at around $89. The goal of the beta program is to collect feedback from users who purchase the board to fine-tune the design and to figure out what I/Os and accessories make sense to bundle with the board. Like the Arduino, we don’t integrate a lot of features onto the mainboard itself (keeps base cost low). Instead, we’d like to make sure that adequate I/O resources exist for developers to hack in the peripheral module they require to complete their project — or for more enterprising developers to build their own flavor of peripheral board and sell their own accessory. There’s a few resources available to get people started on using the boards: a forum for general support and questions, and a wiki containing links to datasheets, schematics, and other more permanent documentation that people will find useful. Adafruit also has available a snazzy hackerboard page with tons of info, well-documented tutorials, and nice photos to boot. One other point of note about the hacker board is that you can install a native gcc toolchain on it, so you don’t need to configure/install a cross-compiler on your host PC to develop for it. Heck, it’s got a 454 MHz CPU and plenty of disk space, so why not? Adafruit has a tutorial on how to install the compiler using a downloadable self-extracting script and a USB dongle. 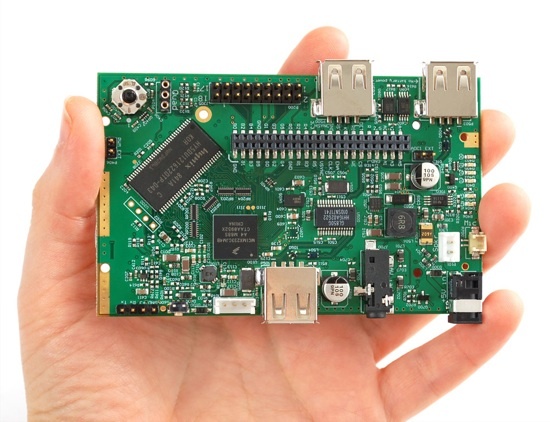 I’ve also heard rumors that an OpenEmbedded port is coming to the board soon, so stay tuned. If you do end up purchasing a board and participating in the beta, please do contribute to the fora and wikis with your feedback. As always, happy hacking! These are great questions to post in the Chumby Hacker Forum! Thanx Ladyada…. gotta get one soon…this one could keep me hacking an aeon…! !